Grandmaster Michael Giron, (Founder) of the Original Giron Escrima Federation was born the 2nd of 4 children on December 31, 1949 to the legendary Grandmaster Emeritus Leovigildo Miguel Giron and Soledad Mapa. Although he is deeply rooted in Stockton, California He presently lives, with his wife, Athena (Tina) in Vallejo, California. Grandmaster Giron also has a daughter, Jamyka Giron and Annita Emerson who reside in the Bay Area. After graduating Edison Senior High School, Grandmaster Giron went to San Joaquin Delta College, (SJDC) and majored in electronics. Master Giron was losing interest fast in college and wanted to do something else, so he enlisted in the United States Air Force in November of 1969as a Ground Radio repair technician. After his three and a half years of duty, he returned home. He was never pushed into learning the art by his father but others questioned why he never wanted to learn. Grandmaster Giron's answer was "I wasn't ready yet," because he knew he would have to fully commit to learning this art and he did not want to be a disappointment to his father. Finally, his training started in 1975. It was not easy training under a Grandmaster who is also your father. Perfection was the only option. Grandmaster Giron attended the normal class downstairs and more often than that he did private training upstairs. A unique part of his training was that he saw history being made as he witnessed the first Filipino Martial Arts Academy in Stockton, CA. Some of the first students were greats like Dan Inosanto, Richard Bustillo, Ted LucayLucay, Dentoy Revillar, Rene Latosa and many more. The Instructors were Angel Cabales, Gilbert Tenio, Max Sarmiento, John Eliab and Leo Giron. 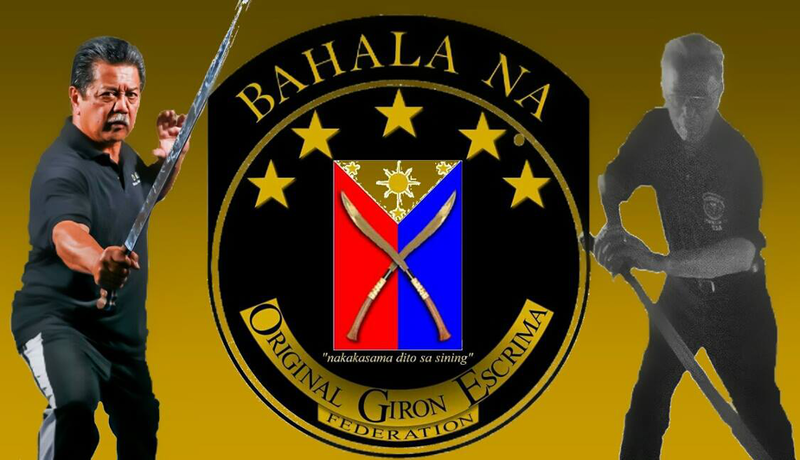 After learning the 20 styles within the Giron System and the private extensive training Grandmaster Giron passed all the testing and earned the right to be a Certified Graduate of Bahala Na Giron Arnis Escrima in 1980. A year and a half later he received his Instructor's Certificate. Grandmaster Giron was proud to participate in the first full contact Escrima tournament on the west coast and possibly the USA. This tournament took place in San Jose, CA in 1982, and was sponsored by the organization called the West Coast Eskrima Society which united several Filipino Masters. The Masters were Mike Inay, Jimmy Tascoa, Max Sarmiento, Gilbert Tenio, Narrie Babao, Dan Inosanto, Richard Bustillo and Leo Giron. Grandmaster Giron discontinued his training to pursued a career as a professional musician. After that was over he was back again training. Then, his father passed on May 21st, 2002. What was different was now the fighting system that he had learned in the 80's had slowly evolved into what is called a modified version. He did not see the reason for change and the fighting system that was learned from his father in the early years stood alone and was battleground proven. In his eyes it was causing more harm than good to the students and the organization that his father had created, so he did one of the hardest things in his life. He resigned from the Bahala Na Martial Arts Association, relinquished his title as Grand Advisor and his lifetime membership to the organization. He then, created the Original Giron Escrima Federation.